Quoted in George Wald, 'The Origin of Optical Activity' (1957). 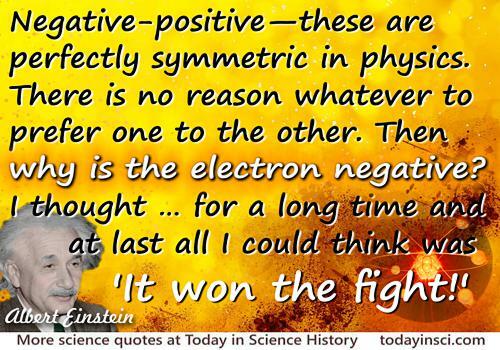 This quote is recalled from a first-hand conversation with Albert Einstein by George Wald in his 1957 paper, 'The Origin of Optical Activity', in Annals of the New York Academy of Sciences. Like a left-hand glove and a right-hand glove are mirror images of each other, there are many molecules in naturally occurring substances with two forms that are mirror-images of each other. The variations have the same chemical formula, with same type of atoms bonded with the same neighbours, but having some geometrical arrangement differences in the direction of branching. Their presence in solutions is detected by different effects on plane-polarized light, hence the term “optical activity.” The variants are designated with a L- or D- prefix (from the Latin words for left and right). Just as a left glove is not shaped to properly fit a person’s right hand, it is notable that in Nature, many biochemical processes favour only the one variant which matches the geometry of the other molecule in the reaction. The opposite form cannot react there. Remarkably, the amino acids which are most used by living organisms are composed of L- rather than D-amino forms. Also, D-ribosides are favored rather than L-ribosides. Thus these words were not recorded directly by Einstein himself in written form, and Wald may not have recollected the quote verbatim as Einstein spoke it, but the sense would be faithful to Einstein’s original words.